The Supreme Court plays a crucial but paradoxical role in American democracy. Many Americans think of it as the head of the least democratic branch of the federal government, designed by the framers of the U.S. Constitution to protect vulnerable minorities against the tyranny of the majority. From the decisions protecting the free speech of accused Communists in the Cold War era to the recent decisions protecting the rights of suspected terrorists after 9/11, the Court, at its best, has often appeared to defend fundamental principles of freedom and equality in the face of popular opposition. Nearly all of the most controversial issues in American politics -- from school prayer and gay rights to affirmative action and abortion -- end up before the Court, and justices are appointed for life precisely so they can consider these issues in constitutional rather than political terms. The Court's greatest power is judicial review, the power to strike down laws passed by federal and state legislatures, on the grounds that they violate basic principles in the Constitution. For all these reasons, it is easy to see why the justices are often praised -- or vilified -- for thwarting the will of the American people. The Court's power to strike down laws explains why it has long been criticized as an anti-democratic institution. Yale legal scholar Alexander Bickel wrote in the 1960s that the Court was a "deviant institution in American democracy" because whenever it strikes down a law, "it exercises control, not in behalf of the prevailing majority, but against it." At the beginning of the Republic, the Court was far weaker than Congress or the president -- it met in the basement of the Capitol for the first half of the 19th century, and was so politically cautious that it struck down only two federal laws between 1803 and 1857. Today, the Court is far more politically secure and assertive: between 1994 and 2002 it struck down all or part of 32 federal laws. As a result, criticisms of the Court from interests on the Left and the Right are often strident, leading retired Justice Sandra Day O'Connor to express concern about the future of judicial independence. The Framers of the U.S. Constitution were less concerned that the Court would impede democracy. In the Federalist Papers, Alexander Hamilton predicted that the federal courts would be the "least dangerous branch" of the federal government, because they had neither soldiers nor money to enforce their decrees. Hamilton also rejected the idea that the Supreme Court was inherently anti-democratic: when it struck down federal and state laws in the name of the fundamental constitutional principles, he explained, the Court would serve democracy rather than thwart it, because the Constitution represented the will of the people, while federal and state laws merely represented the will of the people's temporary and fallible representatives. The Court's power of judicial review would also protect limited government and individual liberty. America's greatest chief justice was John Marshall, who served from 1801 to 1835. Two years after his appointment, in the landmark case Marbury v. Madison, Marshall treated the Court's power to strike down laws as if it were obvious, even though it does not appear explicitly anywhere in the text of the Constitution. But although Marshall asserted the Court's power to strike down laws in theory, he declined to press it very far in practice. Marbury involved a politically fraught confrontation with Marshall's archrival and distant cousin, President Thomas Jefferson. At issue in the case was whether Jefferson's Secretary of State, James Madison, had acted illegally by refusing to deliver the commission of William Marbury, a justice of the peace appointed by President John Adams in the last days of his administration. Marshall defused the confrontation by holding that Marbury did indeed have a right to the commission, but that the Supreme Court had no power to order Madison to deliver it because the relevant federal law authorizing the courts to issue orders of this kind was unconstitutional. 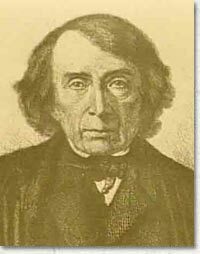 John Marshall's successor, Chief Justice Roger Taney, generally continued the policies of defending strong judicial authority while expressing more concern for states' rights.